Pictured above are three different types of gemstones considered ‘colorless’ or ‘white,’ moissanite, diamond and white sapphire. The differences are subtle but clear, right? Aside from being established as a symbol of everlasting love, there’s a reason diamonds have remained the top choice for engagement rings. With a rating of 10 on the Mohs scale, diamond is the hardest material on earth which makes it the absolute best choice for everyday wear. To satisfy concerns of ethical sourcing, mine-direct Canadian diamonds and lab-created diamonds are always a great option to pursue. 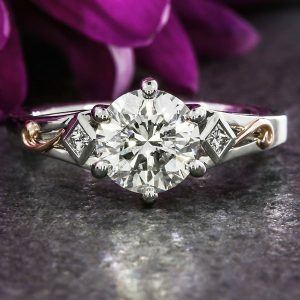 Unlike moissanite which are all cut to the same proportions for each shape and are only offered in specific sizes, diamonds are available in a wide variety of cuts, clarity, color grades and carat weights, allowing for a more unique choice of center stone. Composed of silicon carbide, moissanite was originally discovered 1893 in a meteor crater. Due to its rarity and origin, most moissanite available on the market is lab-created. While there is no certified color grading system in place for moissanite, untreated stones usually compare to a GIA certified K diamond. For color sensitive consumers, there are specialty options that compare to more of a G-H grade, and even one lab that produces a more colorless D-F equivalent. Moissanite vs. Diamond from Green Lake Jewelry Works on Vimeo. White sapphires are becoming an increasingly common center stone for engagement rings. If you have a preference for a natural stone (rather than lab-created like moissanite), white sapphires are a great option. The Mohs scale rates sapphire at a 9, being one of the hardest and most suitable stones available for everyday wear. The two main appearance factors that set white sapphires apart from diamond and moissanite is the difference in fire and body color. 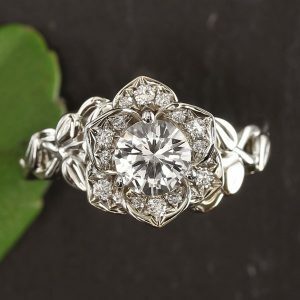 Due to the body color being white rather than colorless like a diamond or near colorless like moissanite, this can sometimes be described as “milky.” If you’re not color sensitive or even prefer a bit of color, white sapphires are a wonderful option as a center stone. 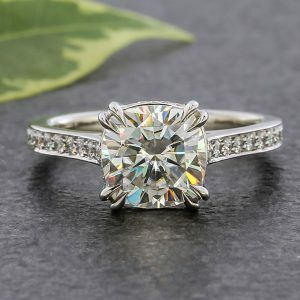 With a lower refractive index than diamond and moissanite, the fire of a white sapphire is rather different, giving off a more understated elegance. Moissanite vs. Diamond vs. White Sapphire from Green Lake Jewelry Works on Vimeo. 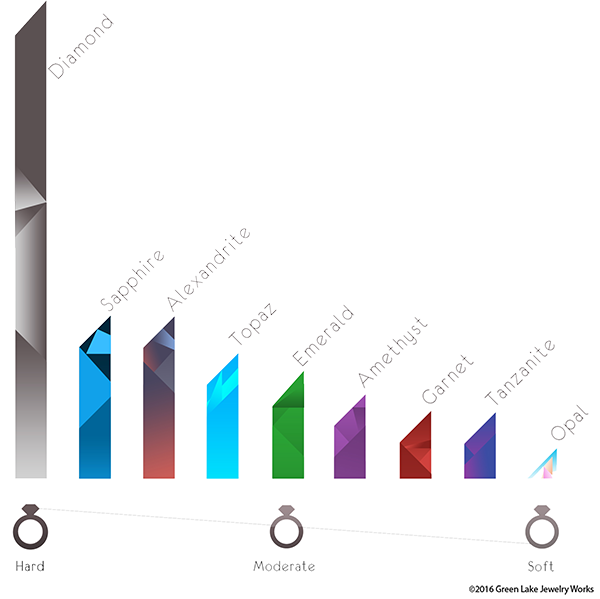 In the end, it comes down to what characteristics and origins you value in a gemstone. Diamond, moissanite and white sapphires are each great options to consider for your engagement ring. For more information on diamonds and sapphires, take a look at our diamond and gemstone education pages.